I believe many of us struggle to see ourselves as God sees us. I know I do. Our perceptions and identity have been measured and labeled according to the world’s standards. It’s the you are not and you will never be words that have been spoken over us that can bring us to the point where we consider ourselves less than. Words matter, they definitely matter. I know I would rather take a beating then to hear again some of the words that have been spoken over me. I want to shut out the voices in this world that say you need to be, act, do, look, talk and walk this way. Let’s put off the identity given to us by the world and put on the identity given to us in Christ. A Princess is a daughter of a King. 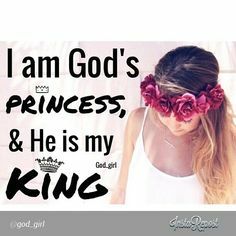 You and I are a Princess of the Most High King, where heaven is His throne and earth is His footstool. I am in awe that the God of the Universe would adopt me into His Royal Family. That He would send Jesus the Prince of Peace to die for me, so I could live to be a part of His Kingdom. A Kingdom that will never end unlike this temporary world we live in now. MISSED YESTERDAY’S POST ON Fearless? CLICK HERE. Cheryl! I love your writing style. You begin with your main point and develop it well. And yes, you are a beautiful princess. You will bless many with this post today.